Located in Southern California's San Jacinto mountain range, and only a half mile off of the Pacific Crest Trail sits a 8.836' (2,696m) granite rock formation known as Tahquitz. History states the Soboba Indian tribe named the mountain after the a legendary luminous spirit-demon. In 1935 Sierra Club members identified the location for rock climbing potential and the following year Jim Smith did the first fifth class ascent via "The Trough" (5.4 grade). The following month Smith put up a new-classic route "Angel's Fright" (5.6), with the name inspired by the world's shortest railroad in downtown Los Angeles, a novel landmark. On June 9th, 2015 I set off to experience Tahquitz for my first time, and the goal to climb the Angel's Fright route. Mountain Project describes Tahquitz (and the neighboring crag Suicide Rock) as the premiere multi-pitch traditional crags in Southern California and offer numerous climbs of all levels from one to seven pitches in length. The rock at both Tahquitz and Suicide is a high-quality granite that varies from smooth and nearly featureless in spots to rough and grainy in others with most of it being somewhere in the middle and quite excellent. Perhaps the most interesting fact about Tahiquitz is the notion it is the birthplace of the Yosemite Decimal System (YDS), the standard classifying methodology in the United States. Oddly, not actually created in Yosemite, the Angeles Chapter of the Sierra Club developed the system in the 1950's. 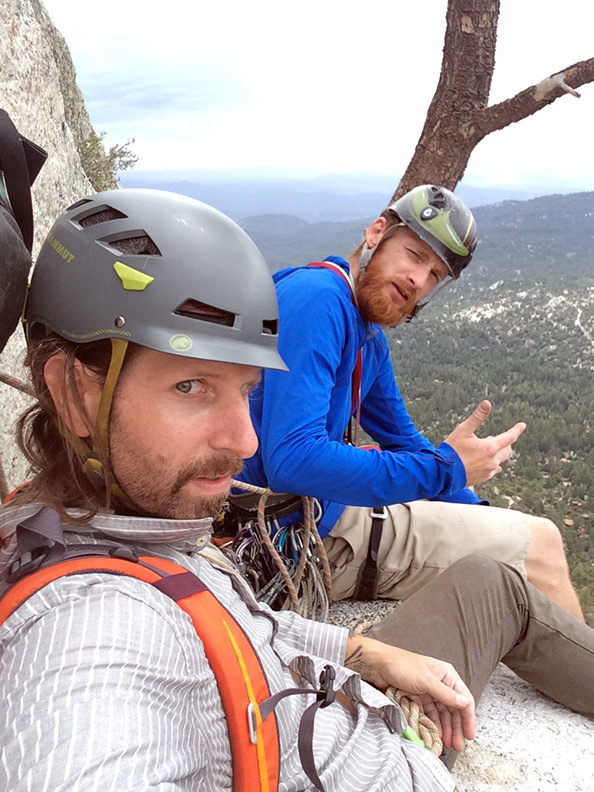 As new routes were constantly being discovered and climbed at Tahquitz, the old method of rating climbs as either easy, moderate, or hard was quickly becoming useless. This new scale running from 5.0 to 5.9 was implemented (now spanning to 5.15+!!) and a local who frequented Yosemite, passed this system on to the climbers in Yosemite, and by the 1960's the YDS was permanent. Everything requires some hard work at Tahquitz, the approach while short, is very steep. The climber's trail gains around 800' in less than half a mile. However, the area is a beautiful forest, and those who enter the San Jacinto wilderness will be treated to real beauty! The weather was on the fence, looked like 50% chance of rain, but we chanced the drive out on a Tuesday. I called in sick from the office and it all paid off. We avoided any rain, nobody else was climbing anywhere, and the overcast clouds providing some descent sun protection. After rolling the dice on the mountain forecast at Half Dome a couple weeks ago, I'm feeling like my harness is good luck! We got to the route, which begins with an awkward chimney, possibly more described as an off-wide depending on what you utilize. It's always an added pain to climb a chimney with a back pack. The crux off the entire route is perhaps the first 40'. Everything is very humbling at Tahquitz, and you quickly observe the route grades are as sandbagged as the reputation states. Here you can see some pro going up the chimney at the start. Taco lead the route, as he had climbed it before and route finding can be a tad scary, the place is no joke! Like a mini-Yosemite, the multi-pitch trad makes you focus and put in work. Here's Taco placing gear. I was happy to get through the first pitch, there's some other gnarly parts but this is definitely the crux. It's just awkward and uncomfortable. Angel's Fright was originally graded at 5.5, the Mountain Project consensus is 5.6, but I have to say parts climb one to two grades above even the consensus. You're getting great exposure right away, the mountain itself sits pretty high up, and the views are incredible. I was perfectly content with the overcast weather, it allowed me to climb without sunglasses which is fairly unusual in Southern California. I love my Oakley's but it's one less thing to worry about losing or breaking. Above is a shameless plug for the Forever Outside cap, putting it to good field testing, note that white sweat building on the brim, ha! Get one in the online store, you're already on the site! If you look above the hat you can see that massive structure of granite popping out, that is Suicide Rock, which holds over 300 climbing routes. Below is Taco at the belay station named "Lunch Ledge" it's large enough to site 3-4 people if you have a group climbing. Another view of Suicide Rock above his shoulder. Wikipedia says: According to legend, the name of Suicide Rock comes from a story of a Native American princess and her lover, who after being ordered to separate, instead committed suicide by jumping off the rock. It is speculated that this story originated as a derivative of Helen Hunt Jackson's Ramona story, in an attempt to boost tourism to this area in the late 19th century. Above you can see me approaching the top of the third pitch, or maybe the top of the second, who knows?? The first pitch is the chimney/face, the next two are crack systems, a tiny roof to pull, and the last pitch is a fingercrack traverse with a friction run out that protects with a single bolt, Taco's favorite. Here's me and Taco taking a break on a small ledge. The exposure is taking effect, perhaps you can see it on my face. Angel's Fright is a 400' (192m) climb that requires 4 pitches, give or take, depending on your route finding. I think we split a pitch for 5 because of the rope drag on one part. We played with the route and kind of went our own way. You're treated to a nice view of the granite as you finish the climb. Look at that lovely granite!!! We made it! Check out those clouds in the background, time to get the heck up out of there. Off that rock before any chance of rain or lightening, it's been fun but bye!! We ate a quick snack, switched on approach shoes for the step walk off and hike back to the car. Was a fairly long day. We had ambition to climb two routes, but we were pretty whipped and satisfied. I think we spent a casual 7 hours out there, car to car. Awesome introduction for me to Tahquitz. I can't wait to climb more routes there and also check out Suicide Rock!